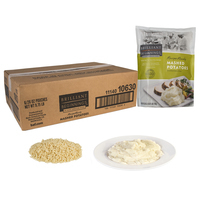 Brilliant Beginnings® Mashed Potatoes, 180 servings (4 OZ) per case, 6/26 oz. pch. 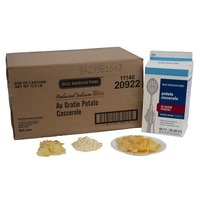 BAF Au Gratin Potato Casserole - Reduced Sodium, 264 servings (4 OZ) per case, 6/2.25 lb. ctn. 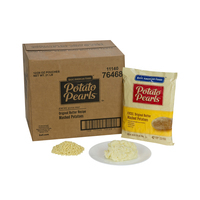 Potato Pearls® EXCEL® Original Butter Mashed Potatoes, 504 servings (4 OZ) per case, 12/28 oz. pch. 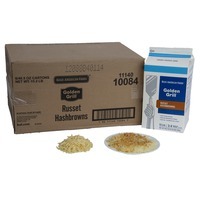 Golden Grill® Russet Hashbrowns, 432 servings (half-cup) per case, 6/40.5 oz. ctn. 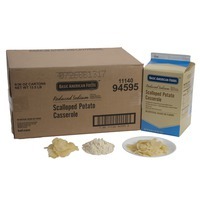 BAF Scalloped Potato Casserole - Reduced Sodium, 264 servings (4 OZ) per case, 6/2.25 lb. 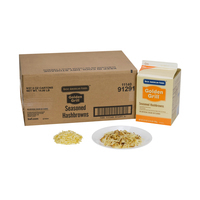 ctn. 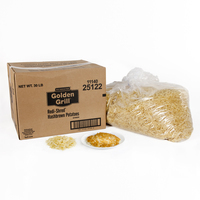 Golden Grill® Seasoned Hashbrowns, 372 servings (half-cup) per case, 6/37.5 oz. 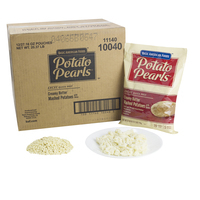 ctn. 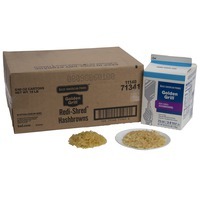 Golden Grill® Redi-Shred® Hashbrowns - Low Sodium, 330 servings (half-cup) per case, 6/2.5 lb. 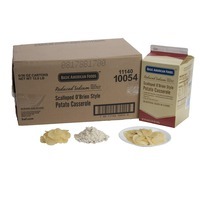 ctn. 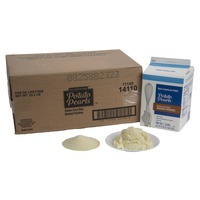 Potato Pearls® EXCEL® Creamy Butter Mashed Potatoes with skins, 468 servings (4 OZ) per case, 12/27.16 oz. pch. 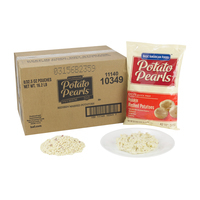 Potato Pearls® EXCEL® Redskin Mashed Potatoes, 336 servings (4 OZ) per case, 8/32.5 oz. pch. 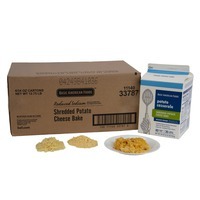 BAF Shredded Potato Cheese Bake - Reduced Sodium, 240 servings (4oz) per case, 6/34 oz. ctn. 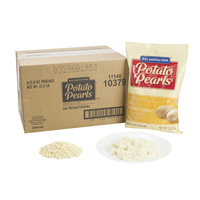 Potato Pearls® EXCEL® Gold Mashed Potatoes, 336 servings (4 OZ) per case, 8/31.9 oz. pch. 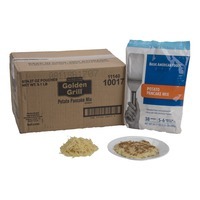 Golden Grill® Potato Pancake Mix, 150 servings (half-cup) per case, 6/24.27 oz. pch. 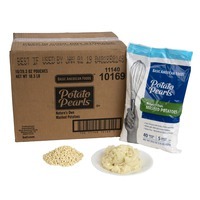 Potato Pearls® Nature's Own Mashed Potatoes, 400 servings (4 OZ) per case, 10/29.3 oz. pch. 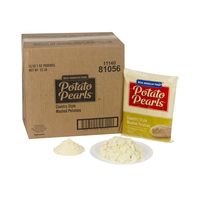 Potato Pearls® Country Style Mashed Potatoes, 480 servings (4 OZ) per case, 12/30.7 oz. pch. 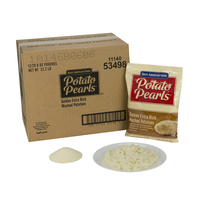 Potato Pearls® Golden Extra Rich Mashed Potatoes, 468 servings (4 OZ) per case, 12/29.6 oz. pch. 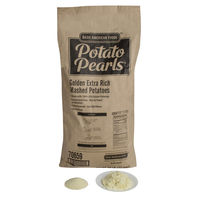 Potato Pearls® Golden Extra Rich Mashed Potatoes, 474 servings (4 OZ) per case, 6/3.7 lb. 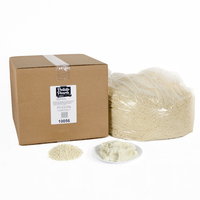 ctn.